Published on August 15, 2018 in California Builder & Engineer, Daily Dirt, Industry Activities and National. Closed Tags: asphalt, bridges, concrete, construction, construction industry, DL-1C, economy, employment, Federal Highway Administration, Federal Highway Administration (FHWA), Federal Highway Trust Fund, gas tax, heavy equipment, Highway Bill, Highway Statistics (2016), highways, infrastructure, Interstate Highway System, jobs, pavement, roads, safety, transportation, TRIP, TRIP analysis of Bureau of Economic Analysis data, U.S. Census Bureau (2017), unemployment. Roads and bridges that are deteriorated, congested or lack some desirable safety features cost California motorists a total of $61 billion annually – a much as $2,995 per driver in some urban areas – due to higher vehicle operating costs, traffic crashes and congestion-related delays. Adequate investment in transportation improvements at the local, state and federal levels is needed to relieve traffic congestion, improve the road, bridge, transit conditions, boost safety, and support long-term economic growth in California, according to a new report released today by TRIP, a Washington, DC based national transportation research organization. The TRIP report, “California Transportation by the Numbers: Meeting the State’s Need for Safe, Smooth and Efficient Mobility,”finds that throughout California, more than two-thirds of major locally and state-maintained roads are in poor or mediocre condition and 1,603 of 25,657 locally and state-maintained bridges (20 feet or longer) are structurally deficient. 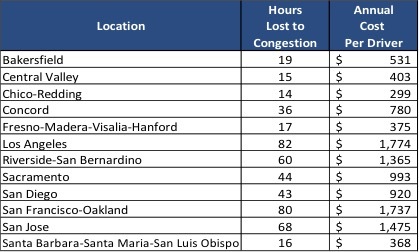 The report also finds that California’s major urban roads are becoming increasingly congested, causing significant delays and choking commuting and commerce. The chart below details costs per driver in the state’s largest urban areas and statewide in the form of extra vehicle operating costs (VOC) as a result of driving on roads in need of repair, lost time and fuel due to congestion-related delays, and the costs of traffic crashes in which roadway features likely were a contributing factor. The TRIP report finds that 68 percent of California’s major locally and state-maintained roads are in poor or mediocre condition. Forty-four percent of California’s major locally and state-maintained roads are in poor condition and 24 percent are in mediocre condition. 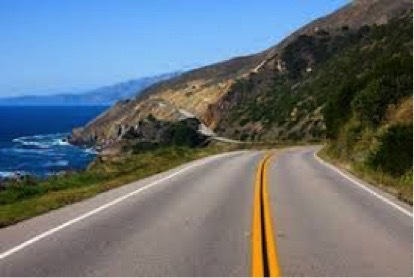 Thirteen percent of California’s major roads are in fair condition and the remaining 19 percent are in good condition. 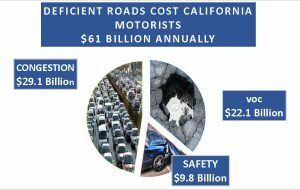 Driving on deteriorated roads costs California motorists a total of $22.1 billion each year in extra vehicle operating costs an average of $843 per driver. These costs include accelerated vehicle depreciation, additional repair costs, and increased fuel consumption and tire wear. Traffic congestion in California is worsening, costing the state’s drivers a total of $29.1 billion each year in lost time and wasted fuel. Eighty-five percent of California’s urban Interstates are congested, robbing commuters of time and money and imposing increased costs on businesses, shippers, and manufacturers, which are often passed along to the consumer. More than half – 56 percent – of California’s bridges are at least 50 years old – the eighth highest rate in the nation. Statewide, 1,603 of 25,657 bridges (20 feet or longer) are structurally deficient, with significant deterioration to the bridge deck, supports or other major components. Bridges that are structurally deficient may be posted for lower weight limits or closed if their condition warrants such action. Traffic crashes in California claimed the lives of 15,730 people over the last five years. California’s overall traffic fatality rate of 1.07 fatalities per 100 million vehicle miles of travel is lower than the national average of 1.18. 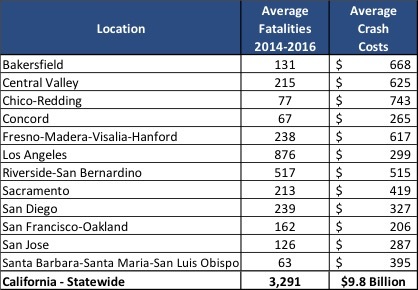 The fatality rate on California’s non-interstate rural roads is approximately four and a half times higher than on all other roads in the state (3.48 fatalities per 100 million vehicle miles of travel vs. 0.76). Traffic crashes in which roadway features were likely a contributing factor imposed $9.8 billion in economic costs on California drivers in 2016. The efficiency and condition of California’s transportation system, particularly its highways, is critical to the health of the state’s economy. Annually, $2.8 trillion in goods are shipped to and from sites in California, mostly by trucks, relying heavily on the state’s network of roads and bridges. Increasingly, companies are looking at the quality of a region’s transportation system when deciding where to relocate or expand. Regions with congested or poorly maintained roads may see businesses relocate to areas with a smoother, more efficient and more modern transportation system. Approximately 7.1 million full-time jobs in California in key industries like tourism, retail sales, agriculture, and manufacturing are completely dependent on the state’s transportation network. Investment in California’s roads, highways, and bridges is funded by local, state and federal governments. In April 2017, the California legislature enacted SB 1 — the Road Repair and Accountability Act. SB 1 increased state revenues for transportation by increasing the state’s gasoline and diesel taxes, implementing a transportation investment fee on vehicles and initiating an annual fee on zero emission vehicles. It is estimated that SB 1 will increase state revenues for California’s transportation system by an average of $5.2 billion annually over the next decade. An urban area is defined as a region’s municipalities and surrounding suburbs for pavement condition and congestion data; bridge and traffic fatality data include a region’s major counties. More than 1,500 of California’s bridges (20 feet or longer) are structurally deficient, meaning there is significant deterioration of the bridge deck, supports or other major components. 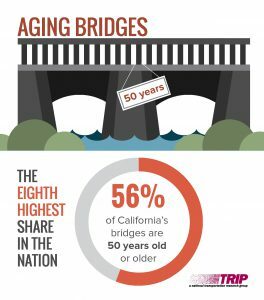 More than half – 56 percent – of California’s bridges are at least 50 years old – the eighth highest rate in the nation. Congested roads choke commuting and commerce and cost California drivers $29.1 billion each year in the form of lost time and wasted fuel. In the most congested areas, drivers lose up to $1,774 and spend nearly three and a half full days each year in congestion. Over the last five years, 15,730 people were killed in traffic crashes in California. Traffic crashes in California in 2016 imposed a total of $29.4 billion in economic costs. Traffic crashes in which roadway features were likely a contributing factor imposed $9.8 billion in economic costs in 2016. The health and future growth of California’s economy rides on its transportation system. 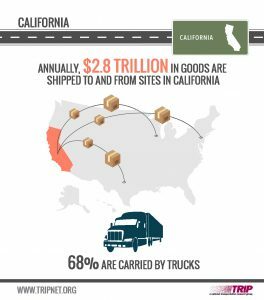 Each year, $2.8 trillion in goods are shipped to and from sites in California, mostly by truck. Increases in passenger and freight movement will place further burdens on the state’s already deteriorated and congested network of roads and bridges. The design, construction, and maintenance of transportation infrastructure in California supports 419,790 full-time jobs across all sectors of the state economy. These workers earn $17.8 billion annually. Approximately 7.1 million full-time jobs in California in key industries like tourism, retail sales, agriculture, and manufacturing are completely dependent on the state’s transportation network. In April 2017, the California legislature enacted SB 1 — the Road Repair and Accountability Act. SB 1 increased state revenues for transportation by increasing the state’s gasoline and diesel taxes, implementing a transportation investment fee on vehicles and initiating an annual fee on zero emission vehicles. It is estimated that SB 1 will increase state revenues for California’s transportation system by an average of $5.2 billion annually over the next decade. On November 6, 2018, Californians will vote on Proposition 6, which, if approved, would repeal SB 1. The elimination of SB 1 revenues would reduce funds available in California for transportation projects to improve road, highway and bridge conditions, improve traffic safety, enhance pedestrian and bicycle facilities, improve public transit and relieve traffic congestion. The design, construction, and maintenance of transportation infrastructure in California supports 419,790 full-time jobs across all sectors of the state economy. These workers earn $17.8 billion annually. Approximately 7.1 million full-time jobs in California in key industries like tourism, retail sales, agriculture and manufacturing are completely dependent on the state’s transportation network. Published on July 19, 2015 in Featured Article and National. Closed Tags: asphalt, construction, construction industry, contractors, economy, employment, Federal Highway Administration, Federal Highway Administration (FHWA), FHWA, infrastructure, Interstate Highway System, pavement, roads, safety, transportation. Published on March 20, 2015 in Constructioneer, Daily Dirt and National. Closed Tags: American Association of State Highway and Transportation Officials (AASHTO), asphalt, bridges, Bureau of Transportation Statistics (BTS), concrete, construction, construction industry, contractors, economy, equipment, Federal Highway Administration, Federal Highway Trust Fund, gas tax, heavy equipment, Highway Bill, highways, infrastructure, Interstate Highway System, National Highway Traffic Safety Administration (NHTSA), New York, Oregon Department of Transportation (ODOT), pavement, roads, safety, Texas Transportation Institute (TTI), transportation, TRIP, U.S. Census Bureau, unemployment. More than one-third of New York’s major roads are in poor condition, while more than one-third of the state’s bridges are deficient or do not meet modern design standards, according to a new report released today by TRIP, a Washington, DC based national transportation organization. Increased investment in transportation improvements at the local, state and federal levels could improve road and bridge conditions, enhance safety, relieve traffic congestion and support long-term economic growth in New York. The TRIP report, “Conditions and Safety of New York’s Roads and Bridges,” examines road and bridge conditions, traffic safety, economic development and transportation funding in New York State. In addition to statewide information, the report also provides regional pavement and bridge condition and highway safety data for Albany, Buffalo, New York City, Rochester and Syracuse. According to the TRIP report, throughout the state 37 percent of major locally and state-maintained urban roads and highways are in poor condition. An additional 43 percent of the state’s major urban roads have pavements in mediocre or fair condition, and the remaining 20 percent are in good condition. Driving on rough roads costs all New York State motorists a total of $6.3 billion annually in extra vehicle operating costs (VOC). Costs include accelerated vehicle depreciation, additional repair costs, and increased fuel consumption and tire wear. More than one-third – 39 percent — of locally and state-maintained bridges (20 feet or longer) in New York show significant deterioration or do not meet current design standards often because of narrow lanes, inadequate clearances or poor alignment. Twelve percent of New York’s bridges are structurally deficient. A bridge is structurally deficient if there is significant deterioration of the bridge deck, supports or other major components. Structurally deficient bridges are often posted for lower weight or closed to traffic, restricting or redirecting large vehicles, including commercial trucks and emergency services vehicles. Twenty-seven percent of the state’s bridges are functionally obsolete. Bridges that are functionally obsolete no longer meet current highway design standards, often because of narrow lanes, inadequate clearances or poor alignment. New York State’s overall traffic fatality rate of 0.92 fatalities per 100 million vehicle miles of travel is lower than the national average of 1.09. Traffic crashes in New York claimed the lives of 5,892 people between 2009 and 2013, an average of 1,178 fatalities each year. Where appropriate, roadway improvements can reduce traffic fatalities and crashes while improving traffic flow to help relieve congestion. Such improvements include removing or shielding obstacles; adding or improving medians; improved lighting; adding rumble strips, wider lanes, wider and paved shoulders; upgrading roads from two lanes to four lanes; and better road markings and traffic signals. The efficiency and condition of New York’s transportation system, particularly its highways, is critical to the health of the state’s economy. Annually, $550 billion in goods are shipped from sites in New York and another $597 billion in goods are shipped to sites in the state, mostly by truck. New York’s extensive system of roads, bridges and highways provides the state’s residents, visitors and businesses with a high level of mobility, while acting as the backbone that supports the state’s economy. New York’s transportation system enables the state’s residents and visitors to travel safely to work and school, visit family and friends, and frequent tourist and recreation attractions while providing businesses with reliable access to customers, materials, suppliers and employees. However, the state’s locally and state-maintained roads, highways and bridges face a significant challenge in the need to improve conditions and traffic safety. As New York works to retain its quality of life, maintain its level of economic competitiveness and achieve further economic growth, the state will need to preserve, maintain and modernize its roads, highways and bridges by improving the physical condition and safety of its transportation network, thus enhancing the system’s ability to provide efficient and reliable mobility for motorists and businesses. Making needed improvements to New York’s roads, highways and bridges could also provide a significant boost to the state’s economy by creating jobs in the short term and stimulating long term economic growth as a result of reduced vehicle operating costs, improved safety and enhanced mobility. Meeting New York’s need to modernize and maintain its system of roads, highways and bridges will require significant local, state and federal funding. New York’s major roads have significant deterioration which provides motorists a rough ride and increases the cost of operating a vehicle. Repairing roads and highways while they are in good or fair condition greatly reduces long-term preservation costs because of the high cost of repairing roads in poor condition. More than a third – 37 percent – of New York’s major locally and state-maintained urban roads and highways have pavements in poor condition. An additional 43 percent of the state’s major urban roads have pavements in mediocre or fair condition, and the remaining 20 percent are in good condition. The following chart details the percentage of major locally-and state-maintained roads and highways in poor, mediocre, fair and good condition in each of the state’s largest urban areas. Roads in good condition can be maintained by preventive maintenance, which costs approximately $85,000 per lane mile; roads in mediocre or fair condition require resurfacing, which costs approximately $575,000 per lane mile; and roads in poor condition require reconstruction to repair the surface and the base under the road, which costs approximately $1,625,000 per mile – 19 times greater than the cost of preventive maintenance. Driving on rough roads costs all New York motorists a total of $6.3 billion annually in extra vehicle operating costs (VOC). Costs include accelerated vehicle depreciation, additional repair costs, and increased fuel consumption and tire wear. The following chart details the annual extra vehicle operating costs per motorists as a result of driving on rough roads in each of the following urban areas. More than one-third – 39 percent — of locally and state-maintained bridges (20 feet or longer) in New York show significant deterioration or do not meet current design standards often because of narrow lanes, inadequate clearances or poor alignment. Twelve percent of New York’s bridges are structurally deficient. A bridge is structurally deficient if there is significant deterioration of the bridge deck, supports or other major components. Structurally deficient bridges are often posted for lower weight or closed to traffic, restricting or redirecting large vehicles, including commercial trucks and emergency services vehicles. Twenty-seven percent of New York’s bridges are functionally obsolete. Bridges that are functionally obsolete no longer meet current highway design standards, often because of narrow lanes, inadequate clearances or poor alignment. 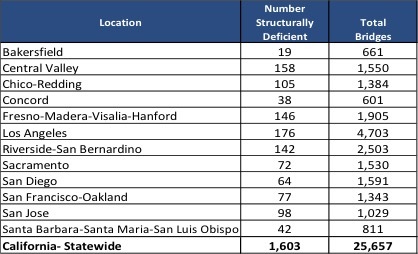 The following chart details the percentage of bridges in each of the following urban areas that are structurally deficient or functionally obsolete. Improving safety features on New York’s roads and highways would likely result in a decrease in traffic fatalities and serious crashes. It is estimated that roadway features are a contributing factor in approximately one-third of all fatal and serious traffic crashes. Between 2009 and 2013 a total of 5,892 people were killed in traffic crashes in New York, an average of 1,178 fatalities per year. New York’s overall traffic fatality rate of 0.92 fatalities per 100 million vehicle miles of travel in 2013 is lower than the national traffic fatality rate of 1.09. The fatality rate on New York’s rural non-Interstate roads was 2.15 fatalities per 100 million vehicle miles of travel in 2013, more than three-and-a-half times higher than the 0.61 fatality rate on all other roads and highways in the state. The following chart indicates the average number of people killed annually from 2011 to 2013 in the following urban areas. The efficiency of New York’s transportation system, particularly its highways, is critical to the health of the state’s economy. Increased deterioration of New York’s roads and bridges and the lack of needed transportation improvements to serve economic development threaten the state’s economic vitality. New York’s population reached approximately 19.6 million in 2013, a nine percent increase since 1990. New York had 11,248,617 licensed drivers in 2012. Vehicle miles traveled (VMT) in New York increased by 21 percent from 1990 to 2013 – from 107 billion VMT in 1990 to 130 billion VMT in 2013. By 2030, vehicle travel in New York is projected to increase by another 10 percent. From 1990 to 2013, New York’s gross domestic product, a measure of the state’s economic output, increased by 46 percent, when adjusted for inflation. Annually, $550 billion in goods are shipped from sites in New York and another $597 billion in goods are shipped to sites in New York, mostly by truck. Seventy-two percent of the goods shipped annually from sites in New York are carried by trucks and another 22 percent are carried by courier services or multiple mode deliveries, which include trucking. A 2014 report by the Oregon Department of Transportation (ODOT) concluded that allowing its state’s major roads, highways and bridges to deteriorate would result in significant reduction in job growth and reduced state gross domestic product (GDP) as a result of reduced economic efficiency. The report found that the cost of making needed road, highway, and bridge improvements is far less than the potential loss in state economic activity caused by a lack of adequate road, highway and bridge preservation. The ODOT report used a sophisticated model that integrates transportation, land use and economic activity to compare how an economy operates when a transportation system is well-maintained versus when it is allowed to deteriorate. 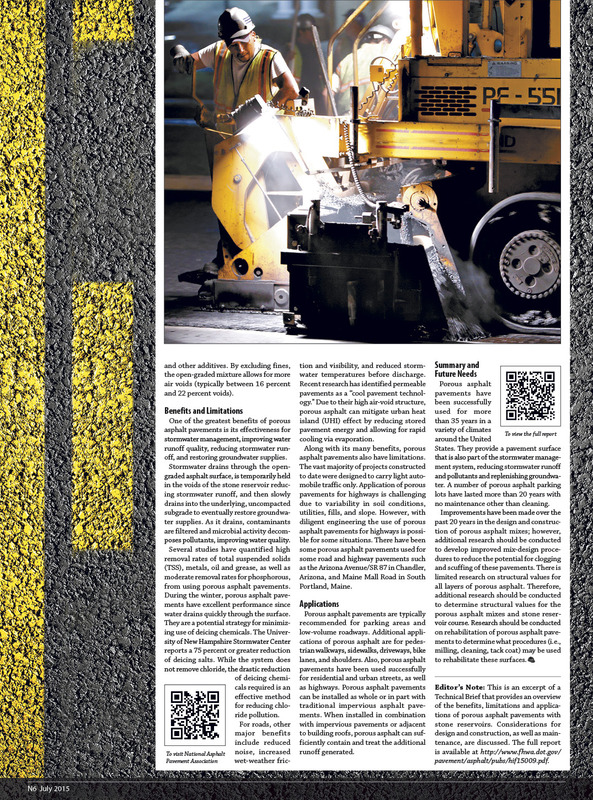 The report found that deteriorated pavements, which result in a rougher and slower ride for vehicles, and deteriorated bridges, which need to be closed to heavy trucks, reduce economic productivity by increasing transportation costs. The report found that allowing roads and bridges to deteriorate reduces business productivity by increasing vehicle operating costs as a result of driving on rough roads, reducing travel speeds and increasing travel times because of route detours necessitated by weight-restricted bridges. As road and bridge conditions deteriorate, transportation agencies are likely to shift resources from preservation projects, which extend the service life of roads and bridges, to more reactive maintenance projects, which results in higher lifecycle costs, the report found. Transportation agencies are also likely to respond to increased road and bridge deterioration by shifting funds from modernization projects, which relieve congestion and increase business productivity, to maintenance projects. Oregon could avoid losing 100,000 jobs and $9.4 billion in GDP through 2035 by spending an additional $810 million more on road, highway and bridge repairs – nearly a 12-to-1 return on investment, according to the ODOT report. Without additional transportation funding at the local, state and federal level, the condition and safety of New York’s roads, highways and bridges will deteriorate. A significant boost in investment on the nation’s roads, highways, bridges and public transit systems is needed to improve their condition and to meet the nation’s transportation needs, concluded a new report from AASHTO. The 2015 AASHTO Transportation Bottom Line Report found that annual investment in the nation’s roads, highways and bridges needs to increase from $88 billion to $120 billion and from $17 billion to $43 billion in the nation’s public transit systems, to improve conditions and meet the nation’s mobility needs. The 2015 AASHTO Transportation Bottom Line Report also found that the current backlog in needed road, highway and bridge improvements is $740 billion. Sources of information for this report include the Federal Highway Administration (FHWA), the Bureau of Transportation Statistics (BTS), the U.S. Census Bureau, the American Association of State Highway and Transportation Officials (AASHTO), the Texas Transportation Institute (TTI), and the National Highway Traffic Safety Administration (NHTSA). All data used in the report is the latest available. TRIP Reports: Deficient Roadways Cost South Carolina Drivers $3 Billion Annually – As Much As $1,300 Per Motorist. Published on January 18, 2015 in Construction, Daily Dirt and National. Closed Tags: American Association of State Highway and Transportation Officials, asphalt, bridges, Bureau of Transportation Statistics (BTS), concrete, construction, construction industry, contractors, economy, employment, equipment, Federal Highway Administration, Federal Highway Trust Fund, gas tax, heavy equipment, Highway Bill, highways, infrastructure, Interstate Highway System, National Highway Traffic Safety Administration (NHTSA), pavement, roads, safety, South Carolina Department of Transportation (SCDOT), Texas Transportation Institute (TTI), transportation, TRIP, U.S. Census Bureau. Roads and bridges that are deficient, congested or lack desirable safety features cost South Carolina motorists a total of $3 billion statewide annually – as much as $1,300 per driver in some areas – due to higher vehicle operating costs, traffic crashes and congestion-related delays. Increased investment in transportation improvements at the local, state and federal levels could relieve traffic congestion, improve road and bridge conditions, boost safety, and support long-term economic growth in South Carolina, according to a new report released today by TRIP, a Washington, DC based national transportation organization. The TRIP report, “South Carolina Transportation by the Numbers: Meeting the State’s Need for Safe and Efficient Mobility,” finds that throughout South Carolina, 46 percent of major roads and highways (state-maintained Interstate, primary and secondary routes) are in poor condition, a significant increase from 2008 when 32 percent of the state’s major roads were rated in poor condition. One-fifth of South Carolina’s bridges are structurally deficient or functionally obsolete. The state’s major urban roads are becoming increasingly congested, with drivers wasting significant amounts of time and fuel each year. And South Carolina is tied with West Virginia for the highest overall traffic fatality rate in the nation. Driving on deficient roads costs each South Carolina driver as much as $1,250 per year in the form of extra vehicle operating costs (VOC) as a result of driving on roads in need of repair, lost time and fuel due to congestion-related delays, and the cost of traffic crashes in which roadway features likely were a contributing factor. The TRIP report calculated the cost to motorists of insufficient roads in South Carolina’s largest urban areas: Charleston, Columbia and Greenville-Spartanburg-Anderson. A breakdown of the costs per motorist in each area along with a statewide total is below. The TRIP report finds that 46 percent of South Carolina’s major roads and highways (state-maintained Interstate, primary and secondary routes) have pavements that were rated in 2014 as being in poor condition, while an additional 38 percent were in fair condition and 16 percent were in good condition. Driving on deteriorated roads costs South Carolina motorists an additional $1.1 billion each year in extra vehicle operating costs, including accelerated vehicle depreciation, additional repair costs, and increased fuel consumption and tire wear. Traffic congestion is worsening throughout the state, costing drivers a total of $775 million annually in lost time and wasted fuel. “The South Carolina Department of Transportation manages the 41,000 miles of state funded roads with the third lowest motor fuel user fee in the nation. With an estimated additional $1.5 billion needed per year for the next 25 years to “get to good”, they are currently having to do the best they can with what they have,” said Eric Dickey, vice president of Davis & Floyd, Inc. and chairman of the South Carolina Alliance to Fix Our Roads (SCFOR). A total of 21 percent of South Carolina’s bridges show significant deterioration or do not meet modern design standards. Eleven percent of South Carolina’s bridges are structurally deficient, with significant deterioration to the bridge deck, supports or other major components. An additional ten percent of the state’s bridges are functionally obsolete, which means they no longer meet modern design standards, often because of narrow lanes, inadequate clearances or poor alignment. South Carolina’s overall traffic fatality rate of 1.76 fatalities per 100 million vehicle miles of travel is the highest in the nation (tied with West Virginia) and significantly higher than the national average of 1.13. Traffic crashes in South Carolina claimed the lives of 4,315 people between 2008 and 2012. The fatality rate on South Carolina’s rural roads was 2.99 fatalities per 100 million vehicle miles of travel in 2012, which is 61 percent higher than the national rural road average of 1.86 fatalities per 100 million miles. The efficiency and condition of South Carolina’s transportation system, particularly its highways, is critical to the health of the state’s economy. The Federal surface transportation program is a critical source of funding in South Carolina. From 2008 to 2012, the federal government provided $1.12 for road improvements in South Carolina for every dollar the state paid in federal motor fuel fees. In July 2014 Congress approved an eight-month extension of the federal surface transportation program, which will now run through May 31, 2015. The legislation will also transfer nearly $11 billion into the Highway Trust Fund (HTF) to preserve existing levels of highway and public transportation investment through the end of May 2015. $3 Billion TRIP estimates that South Carolina roadways that lack some desirable safety features, have inadequate capacity to meet travel demands or have poor pavement conditions cost the state’s residents approximately $3 Billion annually in the form of additional vehicle operating costs, lost time and wasted fuel due to traffic congestion and Traffic Crashes. Greenville – $1,248 The annual costs per motorist of driving on roads that are congested, deteriorated and that lack some desirable safety features in South Carolina’s largest urban areas are: Charleston – $1,168; Columbia – $1,250; Greenville (including Spartanburg and Anderson) – $1,248. Greenville – 48% In the Charleston area, 37 percent of major urban roads are in poor or mediocre condition, Thirty-six percent of major urban roads in the Columbia area are in poor or mediocre condition and 48 percent of major urban roads in the Greenville metro area (including Spartanburg and Anderson) are in poor or mediocre condition. 4,315 deaths 2008 – 2012 From 2008 to 2012, an average of 863 people were killed annually in South Carolina traffic crashes, a total of 4,315 fatalities over the five year period. The fatality rate on South Carolina’s routes is tied for the highest in the nation. South Carolina’s rural fatality rate is also 61 percent higher than the national average (2.99 fatalities per 100 million vehicle miles of travel vs. a 1.86 national average). 21 % As of November, 2014, 21 percent of South Carolina bridges are in need of repair, improvement or replacement. Eleven percent of the state’s bridges are structurally deficient and ten percent are functionally obsolete. $1.12 return on $1.00 From 2008 to 2012, the federal government provided $1.12 for road improvements in South Carolina for every one dollar paid in federal motor fuel fees. 84 % Eighty-four percent of goods shipped annually from sites in South Carolina travel by truck. 3,455,931 There are 3,455,931 licensed drivers in South Carolina. 32% Forty-six percent of South Carolina’s major roads and highways (state-maintained Interstate, primary and secondary routes) were rated in poor condition in 2014, a significant increase since 2008 when 32 percent of the state’s major roads and highways were in poor condition. South Carolina’s extensive system of roads, highways and bridges provides the state’s residents, visitors and businesses with a high level of mobility. This transportation system forms the backbone that supports the Palmetto State’s economy. South Carolina’s surface transportation system enables the state’s residents and visitors to travel to work and school, visit family and friends, and frequent tourist and recreation attractions while providing its businesses with reliable access to customers, materials, suppliers and employees. As part of its efforts to retain business, maintain its level of economic competitiveness and achieve further economic growth, South Carolina will need to maintain and modernize its roads, highways and bridges by improving the physical condition of its transportation network and enhancing the system’s ability to provide efficient and reliable mobility for motorists and businesses. Making needed improvements to South Carolina’s roads, highways and bridges could also provide a significant boost to the state’s economy by creating jobs in the short term and stimulating long term economic growth as a result of enhanced mobility and access. South Carolina must improve its system of roads, highways and bridges to foster economic growth and keep businesses in the state. In addition to economic growth, transportation improvements are needed to ensure safe, reliable mobility and quality of life for all South Carolinians. Meeting South Carolina’s need to modernize and maintain its system of roads, highways and bridges will require a significant boost in local, state and federal funding. Congress will need to pass new legislation prior to the May 31 extension expiration to ensure prompt federal reimbursements to states for road, highway, bridge and transit repairs and improvements. An inadequate transportation system costs South Carolina residents a total of $3 billion every year in the form of additional vehicle operating costs (VOC), congestion-related delays and traffic crashes. TRIP estimates that South Carolina roadways that lack some desirable safety features, have inadequate capacity to meet travel demands or have poor pavement conditions cost the state’s residents approximately $3 billion annually in the form of additional vehicle operating costs, the cost of lost time and wasted fuel due to traffic congestion and traffic crashes. TRIP has calculated the annual cost to South Carolina residents of driving on roads that are deteriorated, congested and lack some desirable safety features both statewide and in the state’s largest urban area. The following chart shows the cost breakdown for these areas. Population and economic growth in South Carolina have resulted in increased demands on the state’s major roads and highways, leading to increased wear and tear on the transportation system. South Carolina’s population reached 4.7 million in 2012, a 35 percent increase since 1990. South Carolina had 3,455,931 licensed drivers in 2012. Vehicle miles traveled (VMT) in South Carolina increased by 43 percent from 1990 to 2012 – jumping from 34.4 billion VMT in 1990 to 49 billion VMT in 2012. By 2030, vehicle travel in South Carolina is projected to increase by another 25 percent. From 1990 to 2012, South Carolina’s gross domestic product, a measure of the state’s economic output, increased by 53 percent, when adjusted for inflation. Nearly half of major roads and highways in South Carolina have pavement surfaces in poor condition, providing a rough ride and costing motorists in the form of additional vehicle operating costs. The share of the state’s major roads in poor condition has increased significantly since 2008. Forty-six percent of South Carolina’s major roads and highways (state-maintained Interstate, primary and secondary routes) have pavements that were rated in 2014 as being in poor condition, while an additional 38 percent were in fair condition and 16 percent were in good condition. In 2008, 32 percent of South Carolina’s major roads and highways (state-maintained Interstate, primary and secondary routes) had pavements in poor condition, while an additional 49 percent were in fair condition and 19 percent were in good condition. In the Charleston urban area, 37 percent of major locally and state-maintained roads are rated in poor or mediocre condition. Twenty-three percent of Charleston’s major urban roads are rated in fair condition and 40 percent are rated in good condition. Thirty-six percent of major urban roads in the Columbia urban area are rated in poor or mediocre condition. Twenty-two percent of Columbia’s major urban roads are rated in fair condition and 42 percent are rated in good condition. In the Greenville urban area (which includes Spartanburg and Anderson) 48 percent of major locally and state-maintained roads are rated in poor or mediocre condition. Nineteen percent of Greenville’s major urban roads are rated in fair condition and 33 percent are rated in good condition. Roads rated in poor condition may show signs of deterioration, including rutting, cracks and potholes. In some cases, poor roads can be resurfaced, but often are too deteriorated and must be reconstructed. Roads rated in mediocre condition may show signs of significant wear and may also have some visible pavement distress. Most pavements in mediocre condition can be repaired by resurfacing, but some may need more extensive reconstruction to return them to good condition. Driving on rough roads costs South Carolina motorists a total of $1.1 billion annually in extra vehicle operating costs. Costs include accelerated vehicle depreciation, additional repair costs, and increased fuel consumption and tire wear. Driving on rough roads costs the average Charleston motorist $294 annually in extra vehicle operating costs, while the average driver in the Columbia urban area loses $362 each year as a result of driving on deteriorated roads. The average Greenville area motorist spends an extra $405 annually due to driving on rough roads. As of November 2014, 21 percent of locally and state-maintained bridges in South Carolina show significant deterioration or do not meet current design standards often because of narrow lanes, inadequate clearances or poor alignment. This includes all bridges that are 20 feet or more in length. Eleven percent of South Carolina’s bridges are structurally deficient. A bridge is structurally deficient if there is significant deterioration of the bridge deck, supports or other major components. Structurally deficient bridges are often posted for lower weight or closed to traffic, restricting or redirecting large vehicles, including commercial trucks and emergency services vehicles. Ten percent of South Carolina’s bridges are functionally obsolete. Bridges that are functionally obsolete no longer meet current highway design standards, often because of narrow lanes, inadequate clearances or poor alignment. In the Charleston urban area, 10 percent of bridges are structurally deficient and 29 percent are functionally obsolete. Fourteen percent of bridges in the Columbia area are structurally deficient, while 10 percent are functionally obsolete. In the Greenville area (which includes Spartanburg and Anderson), eight percent of bridges are structurally deficient and 14 percent are functionally obsolete. Significant levels of traffic congestion cause significant delays in South Carolina, particularly in its larger urban areas, choking commuting and commerce. According to the Texas Transportation Institute (TTI), the average driver in the Charleston urban area loses $647 each year in the cost of lost time and wasted fuel as a result of traffic congestion. The average commuter in the Charleston urban area loses 30 hours each year stuck in traffic. TTI estimates that the average Columbia-area driver loses $663 annually in the cost of lost time and wasted fuel due to congestion. The average Columbia commuter loses 30 hours to traffic congestion every year. According to TTI calculations, the average Greenville-area motorists loses $590 each year in the form of lost time and wasted fuel due to congestion. The average Greenville area driver loses 27 hours annually in traffic congestion. South Carolina shares the highest overall traffic fatality rate in the nation with West Virginia. South Carolina’s traffic fatality rate on rural routes is the second highest in the nation behind Florida. Improving safety features on South Carolina’s roads and highways would likely result in a decrease in the state’s traffic fatalities and serious crashes. Roadway features are likely a contributing factor in approximately one-third of all fatal and serious traffic crashes. Between 2008 and 2012 a total of 4,315 people were killed in traffic crashes in South Carolina, an average of 863 fatalities per year. South Carolina’s overall traffic fatality rate of 1.76 fatalities per 100 million vehicle miles of travel in 2012 is the highest rate in the nation (along with West Virginia) and is significantly higher than the national average of 1.13. The fatality rate on South Carolina’s rural roads was 2.99 fatalities per 100 million vehicle miles of travel in 2012, which is 61 percent higher than the national rural road average of 1.86 fatalities per 100 million miles. The cost of serious traffic crashes in South Carolina in 2012, in which roadway features were likely a contributing factor, was approximately $1.1 billion. The chart below details the average number of fatalities in each of South Carolina’s largest urban areas from 2010 to 2012 as well as the annual cost of traffic crashes to the average motorist in each area. The efficiency of South Carolina’s transportation system, particularly its highways, is critical to the health of the state’s economy. Businesses are increasingly reliant on an efficient and reliable transportation system to move products and services. A key component in business efficiency and success is the level and ease of access to customers, markets, materials and workers. South Carolina is heavily reliant on federal dollars to fund its transportation system. Annually, $156 billion in goods are shipped from sites in South Carolina and another $168 billion in goods are shipped to sites in South Carolina, mostly by truck. Eighty-four percent of the goods shipped annually from sites in South Carolina are carried by trucks and another ten percent are carried by courier services or multiple mode deliveries, which include trucking. Highway accessibility was ranked the number one site selection factor in a 2011 survey of corporate executives by Area Development Magazine. The federal government is a critical source of funding for South Carolina’s roads, highways and bridges and provides a significant return to South Carolina in road and bridge funding based on the revenue generated in the state by the federal motor fuel tax. Sources of information for this report include the South Carolina Department of Transportation (SCDOT), the Federal Highway Administration (FHWA), the Bureau of Transportation Statistics (BTS), the U.S. Census Bureau, the Texas Transportation Institute (TTI) and the National Highway Traffic Safety Administration (NHTSA). Published on January 6, 2015 in Construction News, Daily Dirt and National. Closed Tags: 2015 AASHTO Transportation Bottom Line Report, American Association of State Highway and Transportation Officials, Arkansas State Highway and Transportation Department, asphalt, bridges, Bureau of Transportation Statistics (BTS), concrete, congress, construction, construction industry, Construction News, contractors, economy, employment, equipment, Federal Highway Administration, Federal Highway Trust Fund, gas tax, heavy equipment, high-speed rail, Highway Bill, highways, infrastructure, Interstate Highway System, jobs, National Highway Traffic Safety Administration (NHTSA), pavement, roads, safety, Texas Transportation Institute, transportation, TRIP, TRIP Report, trucks, U.S. Census Bureau. Roads and bridges that are deficient, congested or lack desirable safety features cost Arkansas motorists a total of $2 billion statewide annually due to higher vehicle operating costs, traffic crashes and congestion-related delays. Increased investment in transportation improvements at the local, state and federal levels could relieve traffic congestion, improve road and bridge conditions, boost safety, and support long-term economic growth in Arkansas, according to a new report released today by TRIP, a Washington, DC based national transportation organization. The TRIP report, “Arkansas Transportation by the Numbers: Meeting the State’s Need for Safe and Efficient Mobility,” finds that, throughout Arkansas, nearly a third of major locally and state-maintained urban roads and highways and nearly a quarter of major rural roads and highways are in poor condition. Nearly a quarter of Arkansas’ bridges are structurally deficient or functionally obsolete. The state’s major urban roads are becoming increasingly congested, with drivers wasting significant amounts of time and fuel each year. And, Arkansas’ traffic fatality rate is the fifth highest nationally and the state’s rural non-interstate traffic fatality rate is more than three times the fatality rate on all other roads in the state. Driving on deficient roads costs the state’s motorists approximately $2 billion per year in the form of extra vehicle operating costs (VOC) as a result of driving on roads in need of repair, lost time and fuel due to congestion-related delays, and the cost of traffic crashes in which roadway features likely were a contributing factor. 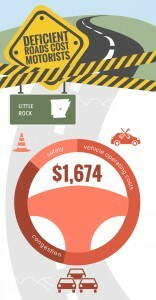 A breakdown of the costs statewide and per motorist in Little Rock area is below. The TRIP report finds that 32 percent of major locally and state-maintained urban roads in Arkansas are rated in poor condition and 42 percent are rated in mediocre condition or fair condition and the remaining 26 percent are rated good. The report finds that 23 percent of major locally and state-maintained rural roads in Arkansas are rated in poor condition, 46 percent are rated in mediocre condition or fair condition and the remaining 31percent are rated good. A total of 23 percent of Arkansas’ bridges show significant deterioration or do not meet modern design standards. Seven percent of Arkansas’ bridges are structurally deficient, with significant deterioration to the bridge deck, supports or other major components. An additional 16 percent of the state’s bridges are functionally obsolete, which means they no longer meet modern design standards, often because of narrow lanes, inadequate clearances or poor alignment. Traffic crashes in Arkansas claimed the lives of 2,849 people between 2008 and 2012. Arkansas’ overall traffic fatality rate of 1.65 fatalities per 100 million vehicle miles of travel in 2012 is the fifth highest in the nation and significantly higher than the national traffic fatality rate of 1.13. Arkansas’ non-Interstate rural roads have a fatality rate in 2012 of 2.71 traffic fatalities per 100 million vehicle miles of travel, more than three times the fatality rate of 0.87 on all other roads and highways in the state. The efficiency of Arkansas’ transportation system, particularly its highways, is critical to the health of the state’s economy. The Federal Highway Administration estimates that each dollar spent on road, highway and bridge improvements results in an average benefit of $5.20 in the form of reduced vehicle maintenance costs, reduced delays, reduced fuel consumption, improved safety, reduced road and bridge maintenance costs and reduced emissions as a result of improved traffic flow. The Federal surface transportation program is a critical source of funding in Arkansas. From 2008 to 2012, the federal government provided $1.42 for road improvements in Arkansas for every dollar the state paid in federal motor fees. In July, Congress approved an eight-month extension of the federal surface transportation program, which will now run through May 31, 2015. The legislation will also transfer nearly $11 billion into the Highway Trust Fund (HTF) to preserve existing levels of highway and public transportation investment through the end of May 2015. Driving on deficient roads costs Arkansas residents $2 billion annually statewide. These costs include additional vehicle operating costs (VOC), congestion-related delays and traffic crashes. In the Little Rock urban area, the average driver loses $1,674 annually as a result of driving on deficient roads. #5 Arkansas’ traffic fatality rate of 1.65 fatalities per 100 million vehicle miles of travel is the fifth highest in the nation. 5702,849 On average, 570 people were killed annually in Arkansas traffic crashes from 2008 to 2012, a total of 2,849 fatalities over the five year period. 3X The fatality rate on Arkansas’ non-interstate rural roads is more than three that on all other roads in the state (2.71 fatalities per 100 million vehicle miles of travel vs. 0.87). 32%23% Thirty-two percent of Arkansas’ major locally and state-maintained urban roads and 23 percent of the state’s major locally and state-maintained roads are in poor condition. 23 % A total of 23 percent of Arkansas bridges are in need of repair, improvement or replacement. Seven percent of the state’s bridges are structurally deficient and 16 percent are functionally obsolete. 26 hours The average driver in the Little Rock urban area loses 26 hours each year as a result of traffic congestion. $112 billion Annually, $102 billion in goods are shipped from sites in Arkansas and another $112 billion in goods are shipped to sites in Arkansas, mostly by truck. From 2008 to 2012, the federal government provided $1.42 for road improvements in Arkansas for every dollar paid in federal motor fuel fees. Arkansas’ extensive system of roads, highways and bridges provides the state’s residents, visitors and businesses with a high level of mobility. This transportation system forms the backbone that supports the state’s economy. Arkansas’ surface transportation system enables the state’s residents and visitors to travel to work and school, visit family and friends, and frequent tourist and recreation attractions while providing its businesses with reliable access to customers, materials, suppliers and employees. As Arkansas looks to retain its businesses, maintain its level of economic competitiveness and achieve further economic growth, the state will need to maintain and modernize its roads, highways and bridges by improving the physical condition of its transportation network and enhancing the system’s ability to provide efficient and reliable mobility for motorists and businesses. Making needed improvements to Arkansas’ roads, highways and bridges could also provide a significant boost to the state’s economy by creating jobs in the short term and stimulating long term economic growth as a result of enhanced mobility and access. With a current unemployment rate of 6.0 percent and with the state’s population continuing to grow, Arkansas must improve its system of roads, highways and bridges to foster economic growth and keep businesses in the state. In addition to economic growth, transportation improvements are needed to ensure safe, reliable mobility and quality of life for all Arkansans. Meeting Arkansas’ need to modernize and maintain its system of roads, highways and bridges will require significant local, state and federal funding. The level of funding and the provisions of the federal surface transportation program have a significant impact on highway and bridge conditions, roadway safety, transit service, quality of life and economic development opportunities in Arkansas. An inadequate transportation system costs Arkansas residents a total of $2 billion every year in the form of additional vehicle operating costs (VOC), congestion-related delays and traffic crashes. TRIP estimates that Arkansas roadways that lack some desirable safety features, have inadequate capacity to meet travel demands or have poor pavement conditions cost the state’s residents approximately $2 billion annually in the form of additional vehicle operating costs (including accelerated vehicle depreciation, additional repair costs, and increased fuel consumption and tire wear), the cost of lost time and wasted fuel due to traffic congestion, and the financial cost of traffic crashes. TRIP has calculated that the average Little Rock driver loses $1,674 annually as a result of driving on roads that have deterioration, are congested or lack some desirable safety features. Population and economic growth in Arkansas have resulted in increased demands on the state’s major roads and highways, leading to increased wear and tear on the transportation system. Arkansas’ population reached approximately 2.9 million in 2012, a 25 percent increase since 1990. Arkansas had 2,199,164 licensed drivers in 2012. Vehicle miles traveled (VMT) in Arkansas increased by 60 percent from 1990 to 2012 – jumping from 21 billion VMT in 1990 to 33.5 billion VMT in 2012. By 2030, vehicle travel in Arkansas is projected to increase by another 30 percent. From 1990 to 2012, Arkansas’ gross domestic product, a measure of the state’s economic output, increased by 64 percent, when adjusted for inflation. A lack of adequate local, state and federal funding has resulted in nearly a third of major urban roads and highways and nearly a quarter of major rural roads and highways in Arkansas having pavement surfaces in poor condition. These deteriorated conditions provide a rough ride and cost motorist in the form of additional vehicle operating costs. Thirty-two percent of Arkansas’ major locally and state-maintained urban roads and highways have pavements in poor condition, while an additional 42 percent of the state’s major urban roads are rated in mediocre or fair condition. Twenty-six percent are rated in in good condition. Twenty-three percent of Arkansas’ major locally and state-maintained rural roads and highways have pavements in poor condition, while an additional 46 percent of the state’s major urban roads are rated in mediocre or fair condition. Thirty-one percent are rated in in good condition. More than three-quarters of major urban roads in the Little Rock area are deteriorated. Fifty-three percent of major urban roads in Little Rock are in poor condition and an additional 26 percent are in mediocre condition. Twelve percent of major roads in Little Rock are in fair condition and the remaining nine percent are in good condition. 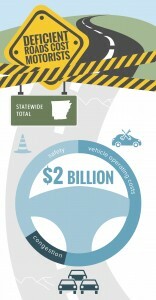 Driving on rough roads costs Arkansas motorists a total of $1.1 billion annually in extra vehicle operating costs. Costs include accelerated vehicle depreciation, additional repair costs, and increased fuel consumption and tire wear. Driving on rough roads costs each Little Rock area motorist $902 annually per in extra vehicle operating costs. Costs include accelerated vehicle depreciation, additional repair costs, and increased fuel consumption and tire wear. Twenty-three percent of locally and state-maintained bridges in Arkansas show significant deterioration or do not meet current design standards often because of narrow lanes, inadequate clearances or poor alignment. This includes all bridges that are 20 feet or more in length. Seven percent of Arkansas’ bridges are structurally deficient. A bridge is structurally deficient if there is significant deterioration of the bridge deck, supports or other major components. Structurally deficient bridges are often posted for lower weight or closed to traffic, restricting or redirecting large vehicles, including commercial trucks and emergency services vehicles. Sixteen percent of Arkansas’ bridges are functionally obsolete. Bridges that are functionally obsolete no longer meet current highway design standards, often because of narrow lanes, inadequate clearances or poor alignment. Arkansas’ traffic fatality rate is the fifth highest in the nation. Improving safety features on Arkansas’ roads and highways would likely result in a decrease in the state’s traffic fatalities and serious crashes. It is estimated that roadway features are likely a contributing factor in approximately one-third of all fatal and serious traffic crashes. Between 2008 and 2012 a total of 2,849 people were killed in traffic crashes in Arkansas, an average of 570 fatalities per year. Arkansas’ overall traffic fatality rate of 1.65 fatalities per 100 million vehicle miles of travel in 2012 is the fifth highest in the nation. The national traffic fatality rate per 100 million vehicle miles of travel was 1.13 in 2012. The fatality rate on Arkansas’ rural non-Interstate roads was 2.71 fatalities per 100 million vehicle miles of travel in 2012, more than three times the 0.87 fatality rate on all other roads and highways in the state. Increasing levels of traffic congestion cause significant delays in Arkansas, particularly in its larger urban areas, choking commuting and commerce. Traffic congestion robs commuters of time and money and imposes increased costs on businesses, shippers and manufacturers, which are often passed along to the consumer. According to the Texas Transportation Institute (TTI), the average driver in the Little Rock urban area loses $545 each year in the cost of lost time and wasted fuel as a result of traffic congestion. The average commuter in the Little Rock urban area wastes 26 hours each year stuck in traffic. The increasing levels of congestion add significant costs to consumers, transportation companies, manufacturers, distributors and wholesalers. The increased levels of congestion can reduce the attractiveness of a location to a company to consider expansion or even to locate a new facility. Congestion costs can also increase overall operating costs for trucking and shipping companies, leading to revenue losses, lower pay for employees, and higher consumer costs. The efficiency of Arkansas’ transportation system, particularly its highways, is critical to the health of the state’s economy. Businesses are increasingly reliant on an efficient and dependable transportation system to move products and services. A key component in business efficiency and success is the level and ease of access to customers, markets, materials and workers. Annually, $102 billion in goods are shipped from sites in Arkansas and another $112 billion in goods are shipped to sites in Arkansas, mostly by truck. Eighty-three percent of the goods shipped annually from sites in Arkansas are carried by trucks and another ten percent are carried by courier services or multiple mode deliveries, which include trucking. The federal government is a critical source of funding for Arkansas’ roads, highways and bridges and provides a significant return to Arkansas in road and bridge funding based on the revenue generated in the state by the federal motor fuel tax. Numerous projects have been completed throughout Arkansas since 2005 that relied heavily on federal funding, including the widening of portions of I-40 and I-540 and the replacement of a US Highway 82 bridge over the Mississippi River in Chicot County. Appendix A details projects completed since 2005 as a result of significant federal transportation funding. From 2008 to 2012, the federal government provided $1.42 for road improvements in Arkansas for every dollar the state paid in federal motor fuel fees. Arkansas State Highway and Transportation Department (AHTD) has already suspended $60 million in planned construction projects due to the uncertainty of the future status of the Highway Trust Fund. Suspended projects include the replacement of the Highway 70 (Roosevelt Road) bridge and the Remount Road Bridge in Pulaski County, widening of five miles of Highway 167 in Independence County, and widening 1.5 miles of Highway 63 in Lawrence County. Further project suspensions and delays are anticipated until Congress resolves the looming insolvency of the Highway Trust Fund. Many needed projects in Arkansas will require significant federal transportation funds to proceed, including the Springdale Northern Bypass, construction of a new three-lane arterial to provide a north-south corridor in northwest Arkansas, and the reconstruction of 8.5 miles of I-440 in the Little Rock area. A full list of projects can be found in Appendix B. A significant boost in investment on the nation’s roads, highways, bridges and public transit systems is needed to improve their condition and to meet the nation’s transportation needs, concluded a new report from the American Association of State Highway and Transportation Officials. The 2015 AASHTO Transportation Bottom Line Report found that annual investment in the nation’s roads, highways and bridges needs to increase from $88 billion to $120 billion and from $17 billion to $43 billion in the nation’s public transit systems, to improve conditions and meet the nation’s mobility needs. 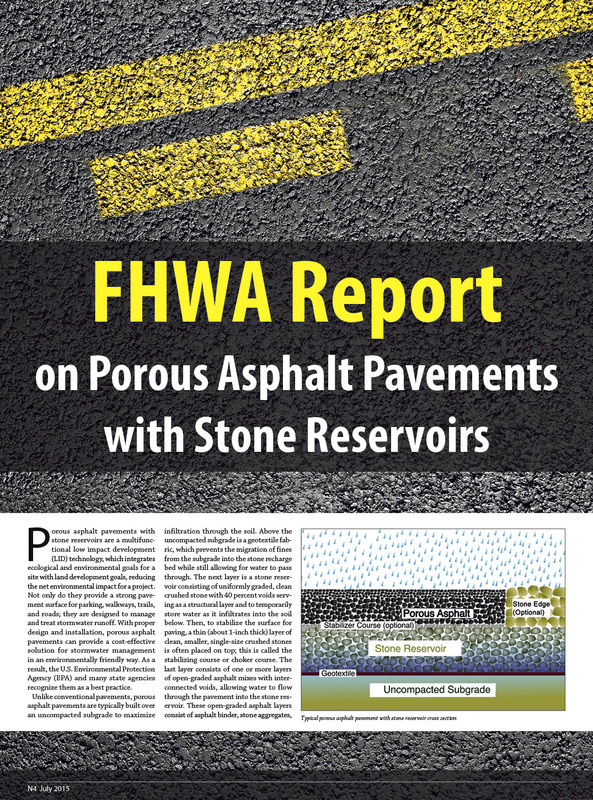 Sources of information for this report include the Arkansas State Highway and Transportation Department (AHTD), the Federal Highway Administration (FHWA), the Bureau of Transportation Statistics (BTS), the U.S. Census Bureau, the American Association of State Highway and Transportation Officials (AASHTO), the Texas Transportation Institute (TTI) and the National Highway Traffic Safety Administration (NHTSA).